US President Donald Trump trashed his Colombian counterpart Ivan Duque on Friday, undermining the already weak position of the pro-American president of Washington’s staunchest ally in Latin America. I’ll tell you something: Colombia, you have your new president of Colombia, really good guy. I’ve met him, we had him at the White House. He said how he was going to stop drugs. More drugs are coming out of Colombia right now than before he was president, so he has done nothing for us. While doing his best to blaming Duque over both countries’ failing counter-narcotics policy in the South American country, Trump ignored the fact that Duque has been the only backer of possible US military intervention in Venezuela. The US used Cucuta—a Colombian city on the Venezuelan border—as the backdrop for a failed attempt to pressure Venezuela President Nicolas Maduro into leaving office. 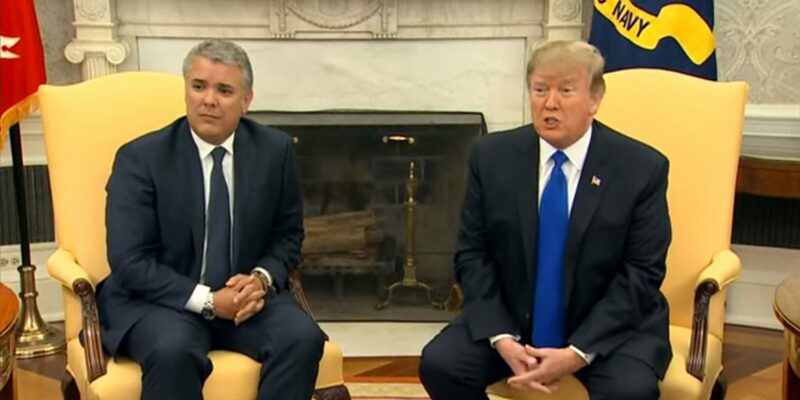 Trump ignored the fact that Duque has bowed to US pressure by trying to get Colombia’s Constitutional Court to reverse its ban on using the pesticide glyphosate to aerially fumigate coca, the base ingredient for cocaine, contrary to experts and other political leaders. The US president appears ignorant of the fact that his administration’s failure to support a peace process is undermining efforts by the Colombian government and the United Nations to get farmers to voluntarily switch from raising coca to growing legal crops, a strategy widely perceived as more effective than aerial fumigation. The US president’s latest diatribe was just the latest in which the US president has made off-the-cuff remarks at odds with existing US foreign policy. Trump’s criticism came immediately after he attacked four other Latin American countries–Mexico, El Salvador, Guatemala and Honduras–for their failure to do what he wants done about immigrants. He had not been asked by reporters to comment on Colombia or the cocaine trade, and his harsh words seemed to be spontaneous. Trump did not threaten to eliminate all US aid to Colombia, as he did to the Central American countries he named. The US President could be correct in claiming that Colombia’s cocaine production is rising, considering the major failures in the peace process that has forced farmers who had eradicated coca to return to growing the illicit crop. The president’s few political allies were quick to jump to his defense. Ex-President Alvaro Uribe, Duque’s political patron, said that if Trump wanted to blame Colombia for the increase in cocaine, he should have gone after Duque’s predecessor Juan Manuel Santos.